Nearly five years ago, the first community garden was established in the Port Towns by a group of ambitious and health conscious young citizens. The PTYC worked effortlessly with Cottage City officials, the Port Towns Community Health Partnership and the Anacostia Watershed society to build and plant the Cottage City Community Garden in 2009. Fast-forward to 2014, and the PTYC is still working to make sure that residents of Cottage City have access to fresh vegetables in walking distance. At the beginning and closure of each planting season, the PTYC galvanizes a corps of volunteers to prepare the garden for the first plant and the first frost. And their hard work pays off! For the second year in a row, the Cottage City Community Garden was presented The Prince George’s County Beautification award. This award recognizes the entire community’s efforts in making the Cottage City Community Garden beautiful and accessible to all residents. 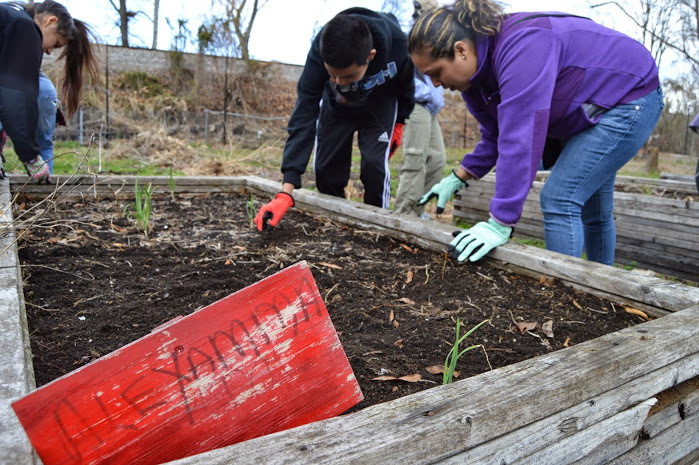 On the first Saturday in November the Port Towns Youth Council returned to the garden to closeout the fifth planting season and harvested tomatoes, sweet potatoes, red potatoes, fingerling potatoes, black eyed peas and green beans. As Wellness Ambassadors, the PTYC consistently uses innovative ways to encourage residents of all ages to maintain healthy lifestyles. Through this and many other projects PTYC members continue to embody their calling to promote a safe and healthy Port Towns Community.